Carrier Command: Gaea Mission is an RTS game by Bohemia Interactive, a remake of the original Carrier Command that was released in 1988. Needless to say that quite a lot of time has passed since then so let's find out whether Carrier Command introduces enough flavour to rejuvenate this old remedy or if Gaea Mission is a complete failure? Much as the name suggests, in Carrier Command: Gaea Mission you take control of an aircraft carrier that stores and deploys amphibious land vehicles called Walrus and flying aircrafts called Manta's. The narrative is briefly explained through the introduction cutscene, naturally since the game is a remake of the original you can almost forgive it for using the same clichéd plot that most sci-fi themed games are paired with, *almost*. I'm last in the race again!? Now although you can probably guess this, it follows somewhere along the lines of the earth being attack and you are the only one that can save it. Now the slight alterations come in to play when you find that the earth has already been conquered and your 'Faction'; the United Earth Coalition must fight off the Asian Pacific Alliance in order to win back Taurus, which eventually leads to taking back earth. You assume the role of captain of the carrier and the pilot of all crafts as you attempt to gain control over Taurus. 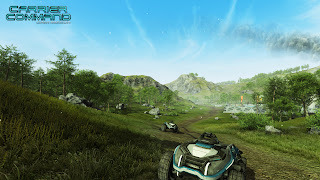 Although the first moments of the game can confuse you into thinking somebody tried to rip off Halo as the developers thought that it would be interesting to introduce the RTS genre game with a first person shooting sequence but apparently Bohemia have not heard of 'first impressions...', it's that or they don't give a monkey's. In hindsight, I would have preferred that they started off with a bunch of text containing tutorials because the simplicity of the story is balanced with the complexity of gameplay. The characters lack the sense of emergency and purpose, and the story comes across as an afterthought that was tacked on leaving all the weight of the games' success to the gameplay. 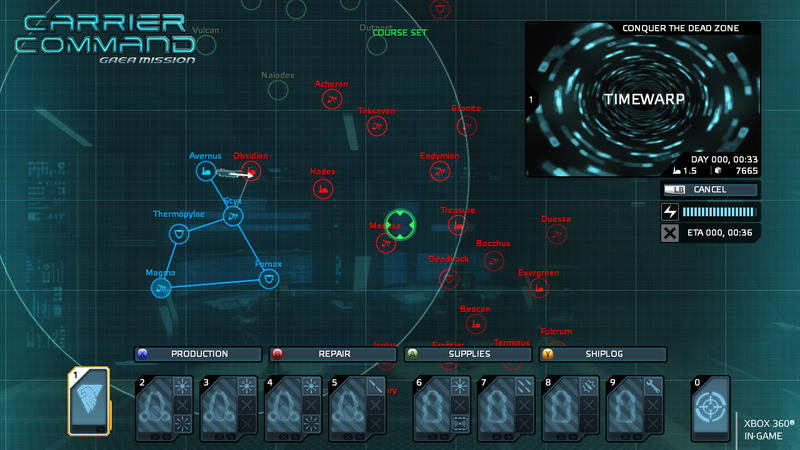 So what is Carrier Command? Well at heart it’s a strategy game where you must remotely control various unmanned vehicles managed by the carrier that holds them all. 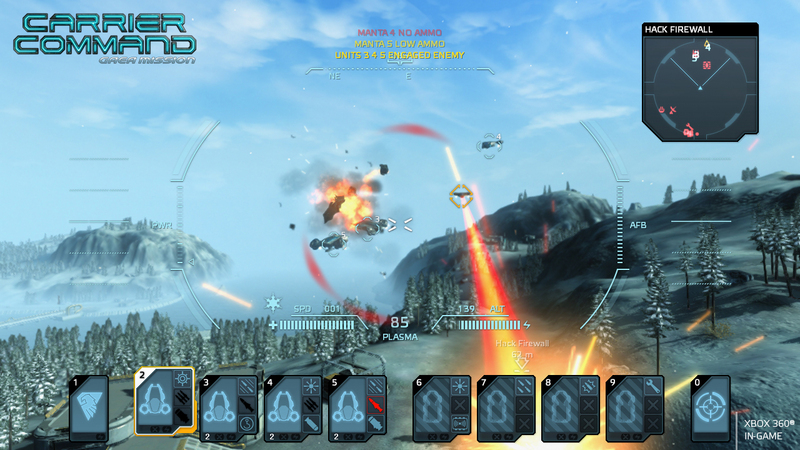 You start with a simple land vehicle and eventually progress to multiple land vehicles and as you progress, flying vehicles are introduced to the Carrier called Manta's. The game can be thought of as a board game where you must devise strategies in order to conquer enemy islands one at a time. 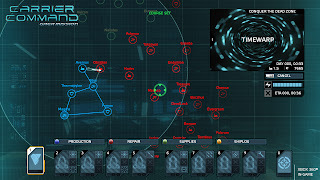 With each island having its own different strategy and approach, the challenge comes in when managing multiple vehicles in order to flank enemies, set up advanced tactical operations in order to outsmart the AI and successfully hack the islands command center in order to take control of the island and gather resources for your next venture. The Carrier as well as the vehicles themselves are customisable but this is limited to stats and weapons rather than livery so don't expect wild paint jobs and neon lighting, the enhancements are pretty cool at first but soon get old. Yeah I took him down. As you progress through the game you will find various power ups for the vehicles you have at your command such as grenade launchers for the Walrus' and speed boosts for the Manta's. The feature that gives Carrier Command the edge over other Strategy games is the fact that you can manually control each individual vehicle as well as assigning each one objectives to complete by themselves which produces a feeling of direct interaction with the action as opposed to watching it play out but never really being a part of it. Lucky it's there too as the AI controlling the vehicles always manages to get across tricky & not so tricky terrain and sometimes manual override is the way to go. The main gameplay is managed through a pretty cool looking Vector style User Interface that shows the highlighted vehicles' onboard camera in the top left corner of the screen as, the main screen displays the map of the current island in real time. Pressing RB on the Xbox controller at any time transitions the map for the current vehicle that's highlighted allowing you to manually steer it whilst your other vehicles are still acting out orders previously appointed. Unfortunately the game play swiftly becomes frustrating as the AI tends to get itself into sticky situations and it is only possible to control one vehicle at a time leaving the AI to deal with the rest of the vehicles, a task which more often than not, the AI deals badly with especially if it involves path finding. The strategy parts of the game are very splendidly portrayed through the use of clear icons and complex cartography looking at the map at any given time clearly displays the relevant information that is required during battle with crisp icons and perfect representations of the land, unfortunately it is the real time part of the game that lacks visual appeal and fails to impress. Although the lighting is generally good, the islands lack life with little to no wildlife and you will more often than not find repetitive buildings and muddy textures. This may be due to the fact that there are no loading screens even as you travel from island to island, but as the real time portion of the game plays a big role in the overall experience some visual delights are sorely missed. Clear and easy to understand designs. The sound element of the game is generally quite weak, sound effects such as explosions and bullets don't pop and voice acting is lazily done, even the soldiers/robots that you encounter along the way lack life. Although I'm not the biggest fan of the RTS genre, I did enjoy what Bohemia Interactive have attempted to do with Gaea Mission, essentially attempting to make the game more immersive by adding elements of gameplay that the player has direct control over. The idea is great but the implementation not so much which is a shame really as the complex controls and lacklustre graphics are a great turn off. If you’re looking for a challenge and have a long history of RTS games conquered then perhaps Carrier Command: Gaea Mission is a game to try, if you’re interested in the genre and are looking for a 'wowing' experience then I recommend you look elsewhere.